When I buy certain things - especially non-essentials (all food is essential!) - I justify the spend by how much the item costs per use. For example - my running shoes are good value. At roughly £85 per pair, I will run around 500 miles before replacing them meaning they cost just 17p per mile. Bargain! Likewise my car. It wasn't new. I purchased it for around £4,000. Since I've had it, I've driven it around 10,000 miles so that's 40p per mile (ignoring trivialities like insurance, petrol and wear and tear). Take my glasses (only figuratively because if you do so literally, I won't be able to see to type this post). Cost £400. I've had them for 3 years. I wear them every day without fail. 36p per day and falling. The dress I bought to wear to a black and white ball when I cruised from New York to Southampton with my Grandad. Cost £200. Worn once. Cost per wear = £200. Ridiculously extravagant but I can't bear to part with it on eBay even though I'll probably never fit into it again. I often buy random bits of clothing in the sale and wear them once as bad it was a bad fashion choice, before guiltily stuffing them into a charity bag. Again, extoritionate. But if I buy a modestly expensive work dress (say £75-£100) and wear it once a week for a year, that's quite a good deal, isn't it? Becks, where are you going with this, I hear you ask? Well to Dan Lepard, of course. At the time of writing this post, I've used Short and Sweet 19 times. It cost me just £8. So that's 42p per recipe I've used. The per recipe cost will decrease over time as I continue to try new ones and repeat-bake ones I've already blogged about. Whereas the James Martin book I bought as a bargain 75% off and costing just a fiver has worked out at £5 per recipe because somehow I've managed to lose the book. And despite making a vow to use lots of different books on this blog, I've still got a few that I've never cooked from meaning their Total Cost of Ownership (TCO, yet another TLA*) remains sky high. Why did I choose Dan Lepard yet again? Well last week the Divisional Financial Controller popped up next to my desk and practically begged me for cake. For once, I didn't have any and so in a show of sisterly solidarity in the testosterone-fuelled environment we inhabit, I promised I'd bake a cake especially for her this week and she could choose what I made. She picked lemon drizzle. Not normally a problem, as I made a really good lemon drizzle cake. But if I was going to blog about it, I'd have to find yet-another-lemon-cake-recipe as I have baked, and blogged about, several different lemon cakes over the past few weeks and thought I'd exhausted the options. Not so. I hadn't thought to try one of Dan's recipes before. 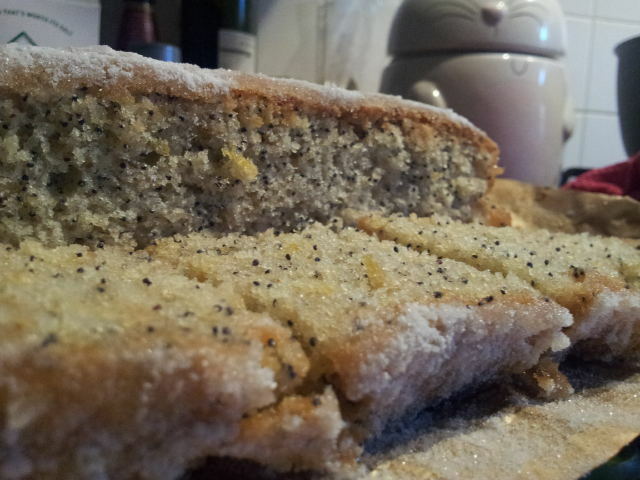 He offered up two - one is a lemon butter cake, containing condensed milk and the other a lemon and poppy seed cake. I hummed and haaahed for a while as I couldn't really get my head round the idea of seeds in a cake. I then thought about making it without seeds, but where was the adventure in that. Re-reading the blurb before the recipe, I was sold on the line that this "the sort (of cake) you dream you'll find in a corner sandwich bar but never (OK, rarely) do". I had to test this theory. The batter contains a whole host of ingredients. Fragrant lemon zest, the usual suspects of butter, oil, sugar, eggs, flour and baking powder. 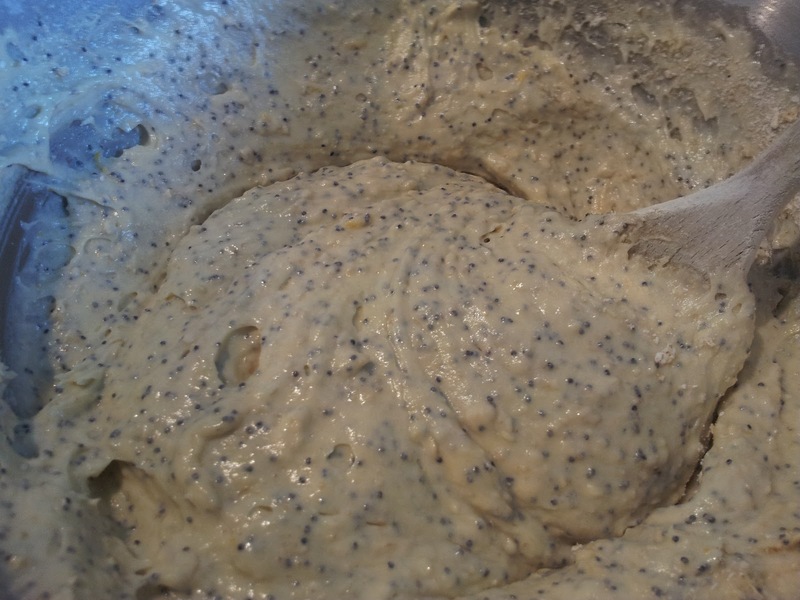 The ubiquitous poppy seeds (which make the mixture look like it contains mashed dragon fruit) and oatmeal. That's right. Finely milled oatmeal. This apparently lends a slightly chewy texture to the finished bake. To me, chewy usually means something that will give you jaw ache. That couldn't be further from the truth of this lovely, slightly crumbly, butter-soft cake. Holy speckled cake batter, Batman! Topped with a zingy lemon syrup that makes your cheeks tingle and then a beautiful crunchy layer of sugar, this cake won't do your teeth or waistline any favours. But if you're going to break the rules and have cake, this is the kind of cake you want to have. I'm so often disappointed by overly sweet lemon cakes that have lost their bite, but this cake has it in spades. I will admit that I am not sure if this is down to the ratio of sugar to lemon juice in the syrup because I took my eye off the pan and paid attention to my Pritt-stick wielding toddler at the critical moment and my syrup reduced by about a third and was really intense. It didn't sink into the cake as far as I would've expected based on Lepard's instruction to heat until the sugar disolved, but the top half-centimetre of the cake was stunning. That's not to say the rest isn't, but that layer is in a whole other league. Of course, the husband likes cake but regular readers will know that a couple of my baking attempts have received scathing reviews from him (Mary Berry's Hokey Pokey Coffee Cake and Nigella's Chocolate Cake spring to mind) but this cake has rocketed to the top of the lemon cake league and apparently I'm now only allowed to make this cake for him and nothing else. Whether Sarah will get a piece of cake tomorrow is anybody's guess. It's packed in tin ready to take to the office, but I have a feeling that there may be a few pieces less in the tin by the morning. The recipe is available online and I suggest you give this a go. The seeds just work as part of the whole and so long as you check your teeth in the mirror once you've finished munching, there is zero reason not to include them. * TLA - Three Letter Acronym. I work in IT. We adore TLAs and management buzz words.